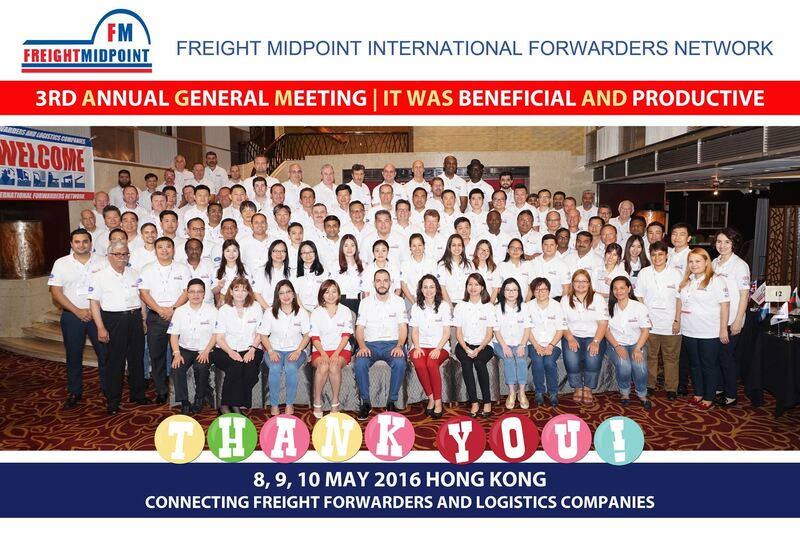 Freight Midpoint International Forwarders Network has recently concluded its 3rd Annual General Meeting with a great success! 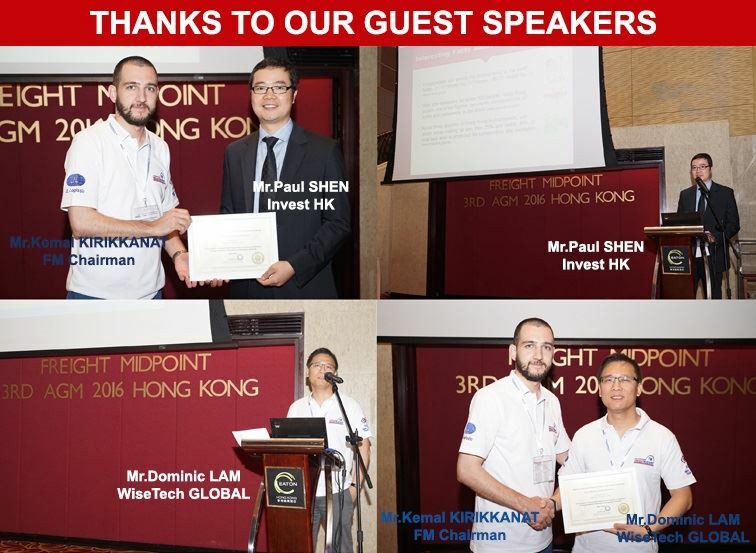 The event was held last May on 8, 9, 10, 2016 at Eaton Hotel, Hong Kong. 104 delegates attended to the conference representing 75 companies from 39 different countries. FM 3rd AGM officially opened with meeting registration on 8 May 2016 right before the cocktail. Welcome Cocktail was held in T-Garden at Lobby Floor, Eaton Hotel. 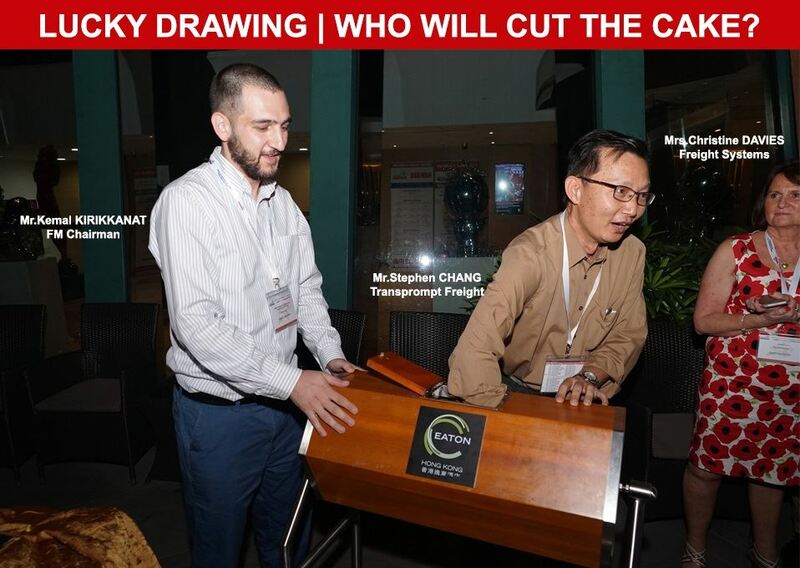 Lucky Draw took place in Welcome Cocktail, Mr. Stephen Chang as last year’s winner from Transprompt Freight, Malaysia made the drawing and announced Mr. Basheer Ahamed from Features Shipping Services, U.A.E. as the winner of the year. 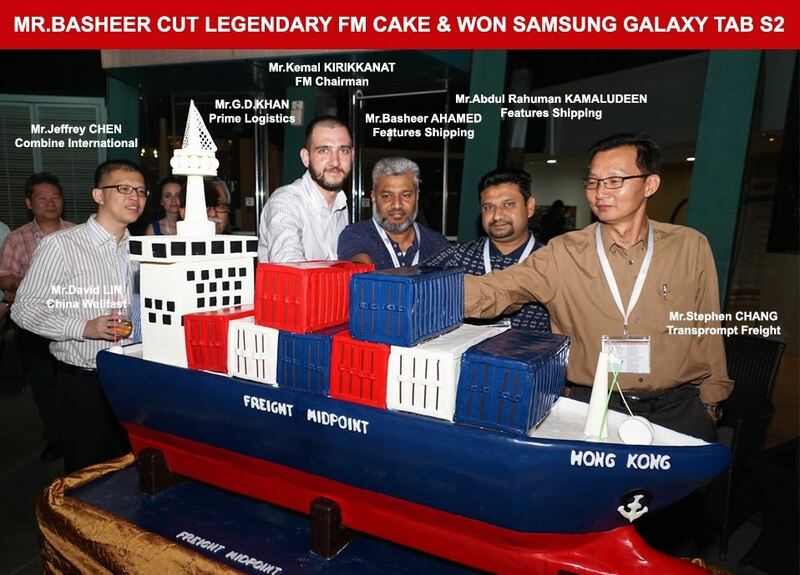 Mr. Basheer won a new Samsung Galaxy Tab S2 and cut legendary FM cake as the winner, which is a tradition in our meetings. It was an evening of fun and delegates were able to not only reunite with their old FM friends but also meet new ones. On 9 May 2016 Freight Midpoint Chairman Mr. Kemal KIRIKKANAT officially welcomed the delegates and gave updates about the network and its developments. 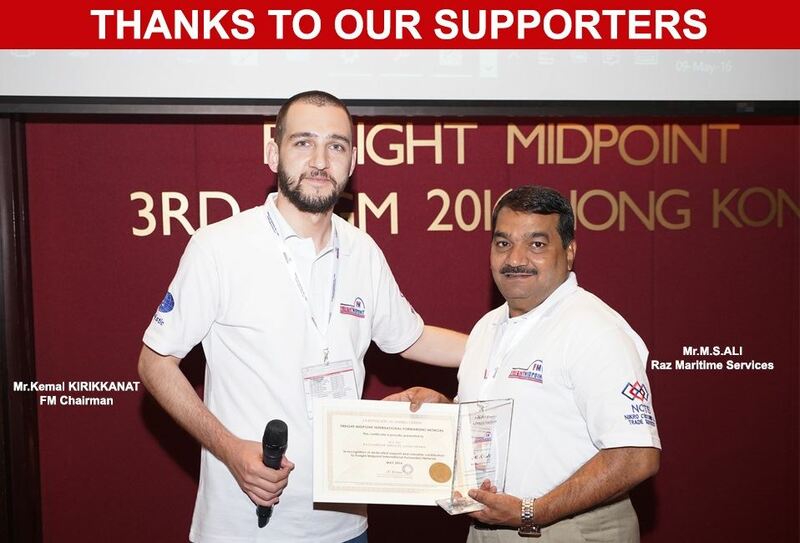 Mr. Kemal also gave sponsorship certificates to Freight Midpoint 3rd AGM Sponsors. From left to right Mr.Kemal KIRIKKANAT (FM Chairman) T-shirt Sponsors: JL Logistic GmbH, Nikro Customs & Trade Services Pty. 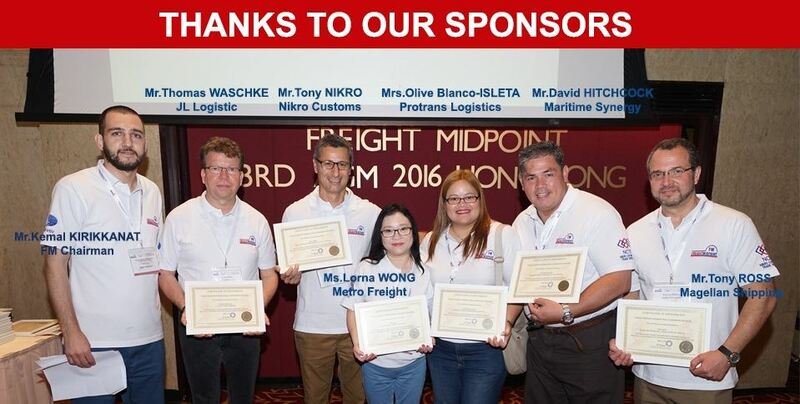 Ltd., Coffee Break Sponsor: Metro Freight Limited, Desk Flag Sponsor: Protrans Logistics Corporation, Lunch Break Sponsor: Maritime Synergy (Thailand) Co., Ltd, Lanyard Sponsor: Magellan Shipping Inc.
After that Mr. Kemal presented certificate of appreciation to the delegates, who recommended some companies and contribute to the expansion of Freight Midpoint. Mr. Ali from Raz Maritime Services was awarded with a plaque since he recommended 30 agents to Freight Midpoint. Mr. Paul Shen, guest speaker from Invest HK, gave a talk about Hong Kong Logistics Industry. As second guest speaker, business partner, Mr. Dominic Lam from WiseTech Global made a presentation about CargoWise One Software. After their speeches Mr. Kemal presented them certificate of appreciation. Face to face meetings plays a major part in communication. It is not just how you said something, but also your facial expressions and body posture. Nobody handles his client’s cargo with someone never met. Scheduled one to one meetings were made between delegates on 9 May and 10 May 2016. Delegates were ready on their tables to catch human touch, make friends, win new partners and increase their shipment volume in one shot through one to one meetings. There was an optional site visit to Modern Terminals Limited (Hong Kong Container Port). Modern Terminals was visited with 20 delegates on 09 May 2016. Delegates, who attended to MTL site visit had the chance to see operations at site. This was amazing and beneficial site visit! On the evening of 9 May, 2016 all delegates were invited to go to the Victoria Harbour for a magnificent dinner cruise and enjoy the spectacle of Hong Kong’s skyline at night. 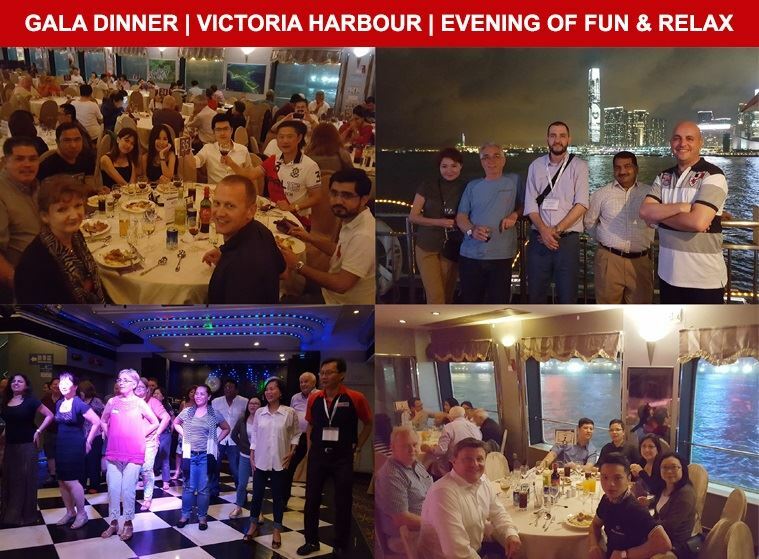 Delegates had a chance to capture the magic of the harbor while having international buffet dinner, enjoying live band performance and meet with other delegates in a non-business environment. It was the evening of fun and relax. 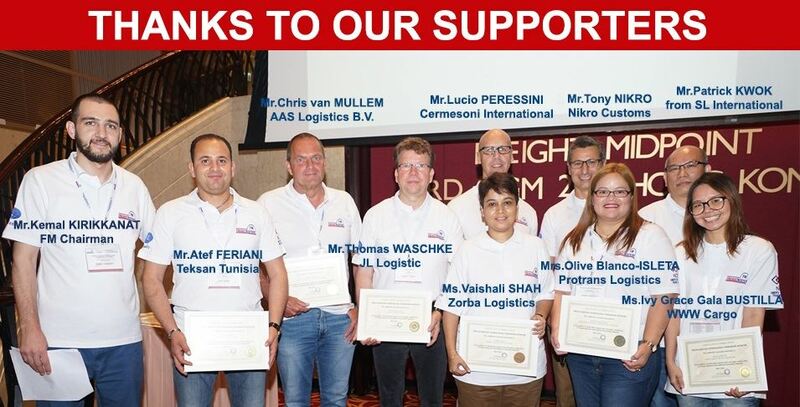 Thank you for attending and being a part of successful Freight Midpoint 3rd Annual General Meeting! Look forward to seeing you FM 4th meeting at Dubai, U.A.E! If you couldn't monitor FM 3rd AGM photos from facebook, you can find us on the flicker.